Background: Cuban revolutionary forces led by Fidel Castro and Che Guevara seize control of Havana (January 1, 1959), Fidel proclaims the socialist character of the revolution (April 15, 1961), Kennedy imposes full trade embargo on Cuba (February 7, 1962), Bay of Pigs/Playa Girón landing orchestrated by the CIA ends in failure (April 17-20, 1961), Cuban Missile Crisis (October 1962), First (“Reunification”) Congress of the United Secretariat (June 1963), Che Guevara is killed in Bolivia by U.S.-trained rangers (October 9, 1967). New Revolutionary Forces Are Emerging,—by James P. Cannon Socialist Workers Party Discussion Bulletin, June 1961. Intellectuals and Revolution,—by James P. Cannon : a 1961 letter to George Novack on C. Wright Mills' Listen Yankee: The Revolution in Cuba (1960). A Classic Reprinted,—by Richard Garza International Socialist Review, Vol. 23, No. 3, Summer 1962, p.92. The Cuba Crisis The Week of the Brink,—by Farrell Dobbs International Socialist Review, Vol. 23, No. 13, Winter 1963, pp. 3-8. “Problems of the Fourth International and the Next Steps,” Draft Resolution of the Socialist Workers’ Party Political Committee—May 1, 1962—In Cliff Slaughter, ed., Trotskyism versus Revisionism: A Documentary History, London:New Park Publications, 1974, Vol. 3: The Socialist Workers Party’s road back to Pabloism, pp. 206-32. “Trotskyism Betrayed: The SWP accepts the political method of Pabloite revisionism,——by the National Committee of the Socialist Labour League (July 21, 1962) In Cliff Slaughter, ed., Trotskyism versus Revisionism: A Documentary History, London: New Park Publications, 1974, Vol. 3: The Socialist Workers Party’s road back to Pabloism, pp. 236-68. Case History of Guantánamo,—by Henry Gitano International Socialist Review, Vol. 24, No. 1, Winter 1963, pp. 9-12, 22. Fidelismo and Marxism,—by Luis Vitale International Socialist Review, Vol. 24, No. 1, Winter 1963, pp. 23-24, 32. Phases of the Cuban Revolution,—by Luis Vitale International Socialist Review, Vol. 24, No.2, Spring 1963, pp.41-45. National Committee of the SLL, Opportunism and Empiricism—March 23, 1963— In Cliff Slaughter, ed., Trotskyism versus Revisionism: A Documentary History, London: New Park Publications, 1974, Vol. 4: The International Committee against liquidationism, pp. 76-105. “Dynamics of World Revolution Today”—Resolution Adopted by the First (“Reunification”) Congress of the United Secretariat (Seventh World Congress)—June 1963 International Socialist Review, Vol. 24, No. 4, Fall 1963, pp. 114-30. Reunification of the Fourth International,—by Farrell Dobbs and Joseph Hansen International Socialist Review, Vol. 24, No. 4, Fall 1963. Defend Cuban Revolution,—by Ernest Mandel International Socialist Review, Vol. 25, No. 3, Summer 1964, pp.80-83. The Trotskyist Slanders Cannot Tarnish the Cuban Revolution,—by Blas Roca International Socialist Review, Vol. 27, No. 3, Summer 1966. Stalinism or Trotskyism in the Cuban Revolution?—by Joseph Hansen International Socialist Review, Vol. 27, No. 3, Summer 1966. Geary Healy, “Problems of the Fourth International”—August 1966—In Cliff Slaughter, ed., Trotskyism versus Revisionism: A Documentary History, London: New Park Publications, 1974, Vol. 4: The International Committee against liquidationism, pp. 268-328. The Cuban Revolution and Its Lessons,—by Hugo Gonzalez Moscoso International Socialist Review, Vol. 29, No. 2, March-April 1968. Criticisms on the U.S. SWP’s Opinion on Cuba—Peng Shuzi—1982. Cuba: The Radical Face of Stalinism —John Lister—1985. 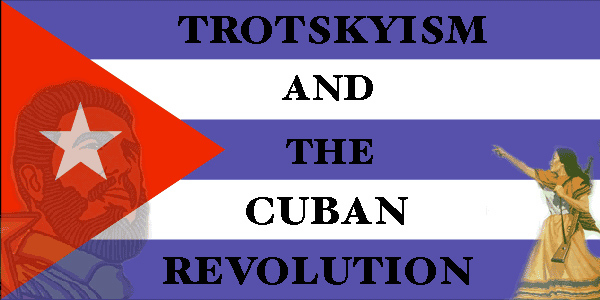 Dissident Cuban Communism: The Case of Trotskyism, 1932-1965—Gary Tennant, Doctoral Thesis, 1999. Cuba and Marxist Theory — From Marxist Bulletin No. 8 published by the Spartacist League.